The overall U.S. birth rate, which is the annual number of births per 1,000 women in the prime childbearing ages of 15 to 44, declined 8% from 2007 to 2010. 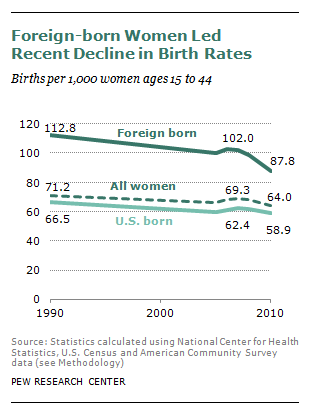 The birth rate for U.S.-born women decreased 6% during these years, but the birth rate for foreign-born women plunged 14% — more than it had declined over the entire 1990-2007 period. The birth rate for Mexican immigrant women fell even more, by 23%. The overall U.S. birth rate peaked most recently in the Baby Boom years, reaching 122.7 in 1957, nearly double today’s rate. The birth rate sagged through the mid-1970s but stabilized at 65-70 births per 1,000 women for most years after that before falling again after 2007, the beginning of the Great Recession.